Through the efforts and cooperation of students, parents and staff, St. Charles School provides an outstanding educational experience. One of the reasons that experience is so rewarding is the many lines of communication shared by the whole community. One of our main channels of communication with St. Charles School families is our Charger Chatter. This is our weekly e-mail blast, sent out every Monday. The most recent issues are posted below for your convenience. It is just one of the many tools used to communicate with the St. Charles School community. If there is no school on Monday, there will not be a Charger Chatter for that week. 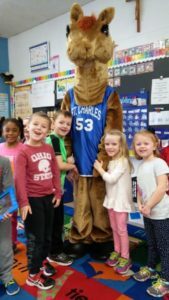 Charger Chatter January 23, 2019 Catholic School Week Details! Welcome Back to St. Charles School! Deadline to submit information for the Charger Chatter is Mondays by 12:00 p.m. Click here to email Maggie Paxson Collins.